Let’s Get to Know … Jennifer Hubbartt! Many marathoners train to tackle the distance one or two times per year. 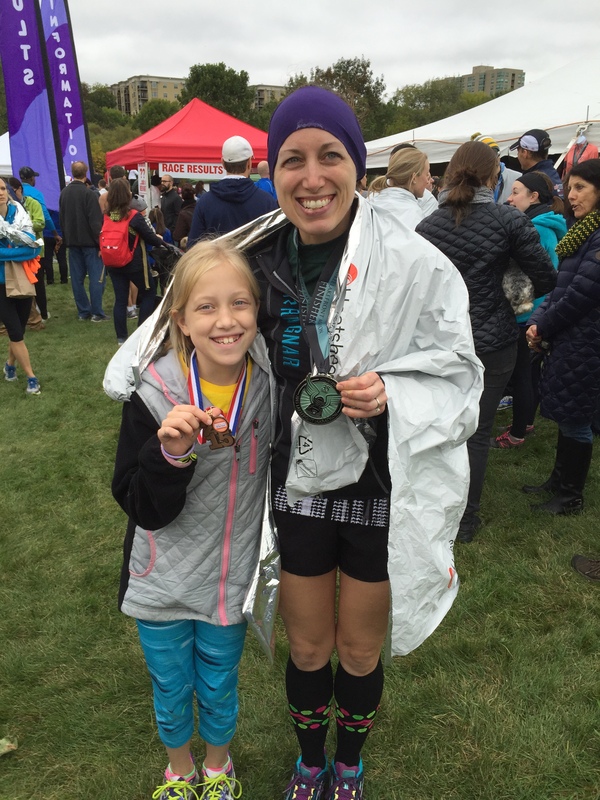 MKE runner Jen Hubbartt loves the distance so much she once ran three marathons over the course of six weeks. 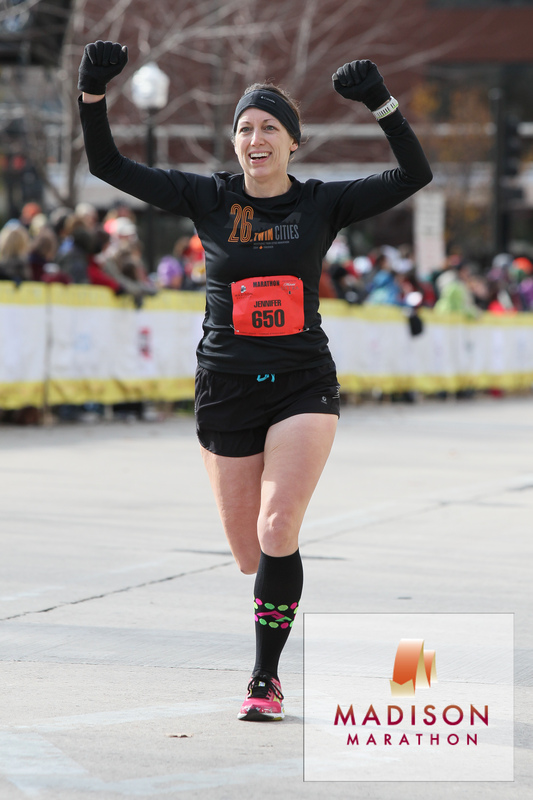 It’s no wonder she was accepted into the Marathon Maniacs – a club for runners who can’t get enough of racing 26.2! Read on to learn more about how she got started in the sport, what a typical week of training includes and her goals for this year. Pre-race routine: I get everything ready the night before: on-course nutrition, gear check bag, outfit and race bib/timing chip, and set my coffee pot for the next morning. On race morning, it’s an early breakfast of either peanut butter, banana and honey on toast or eggs, sweet potatoes and avocado, then coffee drinking and weather stalking. Favorite post-race treat: This is a decision that I will agonize over from days before a big long-distance event throughout a marathon. I am partial to a margarita and chips and guacamole at my favorite Mexican restaurant, or Kopp’s frozen custard. Or both. Favorite shoes to race in: These days I race in Brooks Ghost, although I will do shorter runs in Saucony Kinvaras, and I am trying to find the perfect trail shoe. How did you get started with running and what’s kept you running over the years? In 1997, I finished my first year of college at least 40 pounds overweight and with a newly diagnosed thyroid disorder. I came home that first year unhappy with how I looked and felt. I lost some weight initially through diet and exercise, but not in the most healthy of ways. A few years later, my boyfriend (now my husband) and I had joined a gym to get in better shape, and working out became a bit of a habit. After a while I saw an ad in the newspaper for a local women’s triathlon and decided to try it out – without having a bike, any swimming abilities, or much running endurance. Upon completing that sprint distance race I was a little hooked, and suddenly signing up for 5K and 10K races and other sprint distance triathlons nearly every weekend. A couple of long-distance moves and a having a baby put fitness on the back burner for a while, but once I settled into a routine upon moving to Milwaukee almost ten years ago, I began getting into more of a workout routine again, and decided to run the Chicago Marathon the year I turned 30. After finishing my first 26.2, I wanted to run one marathon per year during my 30s. I’ve recently completed marathon #16 at the Trailbreaker Marathon on April 2, which, of course, averages to more than one marathon per year to date. Needless to say, I became more hooked on the marathon distance. What has kept me running all these years is the fantastic running and multisport community I have found in Milwaukee. Through the Badgerland Striders, Milwaukee Running Group – OMG, and my newest crew of trail-running friends (woot! 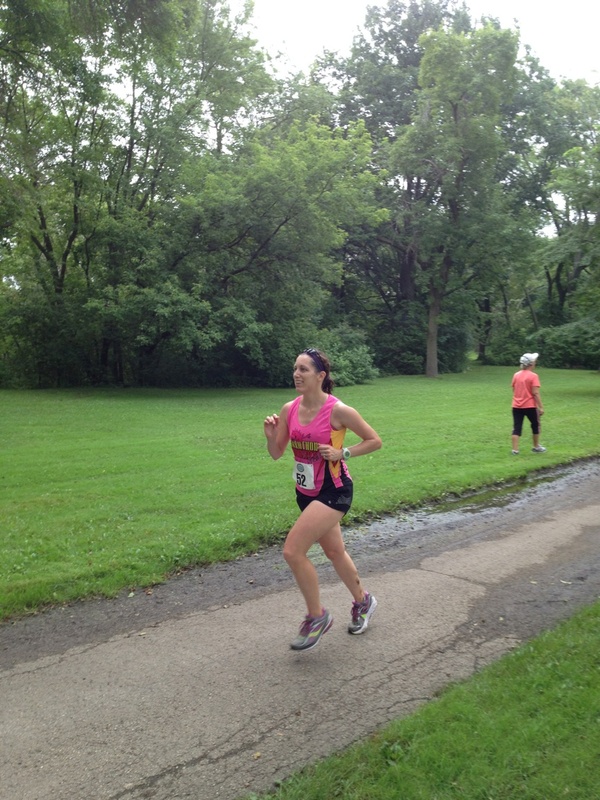 ), I am encouraged to try harder and keep up with my running buddies. There is also no shortage of outstanding races right in our area, anywhere from the 5K distance to ultramarathons. If only I had unlimited funds to run all the races! It’s not so much a quote or philosophy that inspires my running, but it’s my two young daughters. I want to set a good example, both in the importance of starting healthy habits early, and that hard work and discipline are important for achieving your dreams – and the journey toward those dreams is very rewarding. This year I’m excited about tackling the 50K distance for the second time at the Ice Age Trail Race. My biggest focus this year is Ironman Wisconsin, my first full-distance triathlon. 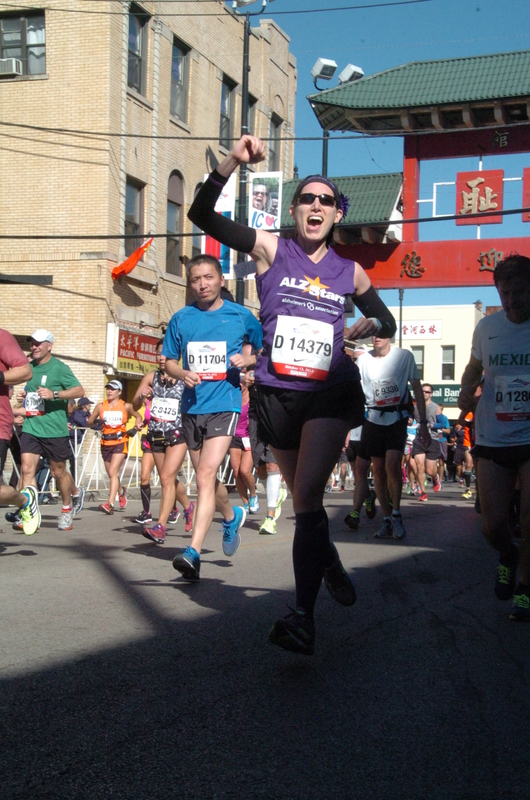 After that, I’m pacing the Lakefront Marathon – my first time as a pacer for a full marathon! – and I have some unfinished business with those hills on the Milwaukee Running Festival’s marathon course. After that, I have my eye on working toward the coveted BQ. These days I run three days a week (a “run whatever feels right” pace, speed work and a long run), bike three times a week, swim three times a week, and strength train twice a week. The hours on the weekends will get longer as I get further in my Ironman training. Tell us a bit about Marathon Maniacs. How did you get involved with the group? Joining Marathon Maniacs was a bit on accident. I had heard of the group from a friend, and briefly looked up their requirements online. A few weeks later, when it was time to consider which fall race to run the following year and I’m was flooded with all of the promotional emails, I found I couldn’t decide between Lakefront Marathon and Chicago Marathon (one week apart) and the Madison Marathon, which was then four weeks later. A friend somehow convinced me that it wouldn’t feel as hard as I thought it would be – so, figuring I’d also qualify to be a Marathon Maniac, I ran all three marathons that year (decent finish times for me, too! ), signed up to be a Maniac, and bought my pink singlet that advertises how certifiably insane I am! I don’t run marathons every weekend across the country to achieve higher Maniac statuses…yet. Why did you decide to take on the Ironman challenge? Have you had to change your running to accommodate training for a triathlon? Do you think triathlon training has benefitted your running? I always thought the 140.6 mile triathlon challenge was crazy and impossible for me. But then I ran three marathons in five weeks – in the same year my husband Andy completed Ironman Wisconsin himself – and then thought it was definitely possible. Seeing the incredible crowd support on race day – especially at the end of the day when I saw one of the triathletes turn the corner just after the Capital building and see the finish line and wipe a tear from his eye – I knew this was something I needed to experience. That was almost three years ago, and this year happened to be the year it worked out best with our family’s schedules and finances. Ironman training will actually require less running than I would normally put in for a typical marathon training cycle. Much of that race day will be spent on the bike (also my weakest sport) so I will need to spend more hours in the saddle, but I will still put in three days a week of running, and occasionally brick workout, where I practice running right off the bike and experience a new set of fatigued muscles. I think the triathlon training will benefit my running from continuing to build up my overall endurance even more and engaging new sets of muscles through the other disciplines, as well as not getting burned out mentally on any one sport. Definitely the lakefront and Lapham Peak for trails. I appreciate that the Oak Leaf Trail is accessible from so many places, including a short 2.5 mile run from my house. It’s so hard to choose…Lakefront Marathon will always have a special place in my heart as it’s a race I had a huge PR and my first sub-4:00 marathon my first year running. The Milwaukee Running Festival marathon gave me a great tour of my adopted city, opening my eyes to so much of what MIlwaukee has to offer. Having two great marathons so close to home is perfect for an endurance junkie like me. With access to so many trails, paths, the scenic lakefront, races big and small, and an inviting running community, Milwaukee makes for an endless playground for endurance athletes. The local brews and custard for which MIlwaukee is famous make for great post-race treats, too! Thanks so much for chatting with us, Jen!